I haven’t quite been well for the last four days and have been severely out of action. Made the first move out of home today for a drive to Bandra Kurla Complex for some work. To my horror, I discovered that there was some Vishwa Hindu Sammelan being organized at BKC. The roads were filled with various hues of saffron covering the rural Maharashtrian tourists on their first visit to Mumbai. There also was Poonam Mahajan showcasing her beatific smile from illegal hoardings in the backdrop of Jai Shri Ram war-cries and at least 30 of those huge Police trucks with the battalions deployed all over. I was suddenly taken back to Advani’s Rath Yatra that I had witnessed at the Rajendra Nagar over-bridge in Patna, and while the context today was not as militant, the confused feeling inside my head was the same… of unease, discomfort and fear, not being able to understand the motivation behind such a loud and ferocious assertion of the faith. 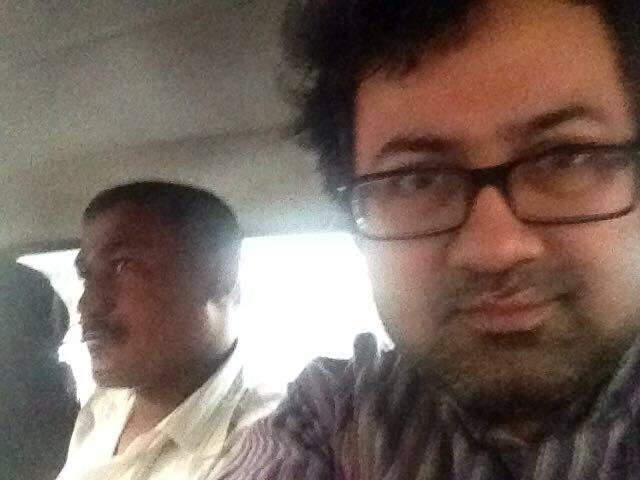 I drove back home, and had to leave again in an auto to Sion to get my other car from Servicing. (Yeah. First world issues. I know.) On the LBS Road just before Sion, I was suddenly greeted by a sea of green flags, long beards and Aligarh pyjamas. There were speaker-stacks on the side of the road matching the length and breadth of the Gateway of India, with their thump hitting the insides of the intestines, playing what sounded like some Islamic religious songs. I could not understand the context. But the feeling in my head was exactly the same that I had encountered not too long time back. The auto stopped at the Sion station and I had to switch to a taxi. Had totally forgotten about this little technicality that no autos run beyond Sion. Womenfolk and cabbies always find reasons to reject me, and it was only after a wait for almost half hour that I finally found an affable Sikh driver asking me to hop in. The moment the car was about to leave, a Muslim man along with his burqa-clad wife carrying a toddler leaned in, and asked the cabbie to take them to Sion Hospital. Of course, I was in the cab already, so the driver expressed his inability, and zipped the car past the yellow blinking light to reach the other side of the signal. Soon enough, the couple crossed the road and was surprised to find us waiting for them. Thus began our 5-minute journey towards Sion Hospital. A Hindu, a Sikh and a Muslim family travelling together to ensure that a toddler got timely treatment for whatever was bothering him. We talked about the baby and his health and told the mother that all would be okay. I don’t know how much of a Hindu I was or how much of a Muslim or Sikh they were in that little ride that we took together. There were no Sammelans or congregations that we were going to. We weren’t getting satiated by loud songs or war-cries either. No flags were being carried. No overt symbols of our respective religiosities were being flashed. And yet, I knew I was a good Hindu. And that the couple were good Muslims, and the cabbie was a good Sikh. All would be okay. I hope. I pray. PS: Of course, I had to spoil it all by being the lowbrow low-light selfie-taker. But in my defence, I was just too overwhelmed by the moment, and what the heck, I am so good-looking!